Country Friends was recorded in Newcastle, NSW with the help of long time friend and country singer Alby Pool. Alby would bring his band No City Limits from Perth to Tamworth and they were one of the most popular and professional acts at the Tamworth Festival for many years. Peter Catlin recorded and mixed the album at Sugarloaf Studio. The talented Kelvin Nolan plays rhythm and lead guitar, Mick Albeck plays fiddle, Tommi Grasso pedal steel and debuts on dobro. Steve Fuller keeps the time on drums while Alby plays bass and joins with wife Annie to do harmonies. A very young Catherine Britt is a surprise guest on the album in a duet with Neville. 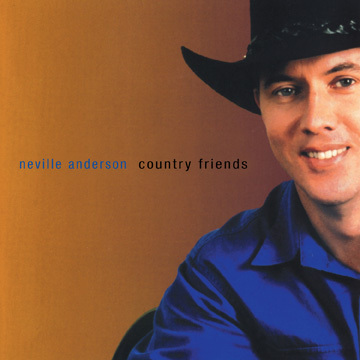 Neville made this album as a tribute to the country singers that he has listened to for so many years of his life. They feel like friends and so he called the album Country Friends. After an Album of all originals Neville felt his second album should be a tribute to those who had influenced his style over the years. The songs were chosen from a list of over 300 songs in Neville’s repertoire. They had to be songs that Neville did as part of his live shows and they had to cover the key influences in some way. There are tips of the hat to Slim Dusty, Merle Haggard, Waylon Jennings, Johnny Cash, David Ball, George Strait, Conway Twitty, Harland Howard, Lefty Frizzell, Ed Bruce, Lyle Lovett, Willie Nelson, Buck Owens, Webb Pierce and Charlie Pride. 1. She’s Gone, Gone, Gone – Written by Harland Howard, one of my favourite writers and recorded by Lefty Frizzell, one of my favourite singers. It’s got a bit of a Buck Owens feel as well and is a good up beat song that roles along. I do this song a lot, especially if I get to sing with a band. 2. Diane – A song recorded by Ed Bruce, one of the classic voices of country and a great song writer as well. I can hear Waylon doing this song, though I am not sure if he did. It is a very fatalistic cheating song that I have always enjoyed performing because it describes the no win situation so well. 3. The Long Black Veil Sample - this is one of my favourite classic country songs written by Marijohn Wilkin and Danny Dill who are both famous song writers . I can listen to Lefty’s version over and over and always hear something different in his melody. Johnny Cash covered it too. It is such a strong song that it always sounds good. Check out Mick Jagger’s version with the Chieftains if you get a chance. 4. Further Down the Line Sample – I like almost everything that Lyle Lovett does. He’s different but very talented as a writer and a singer. Not always traditional but always interesting. Willie recorded this song too and he is another of my all time favourites. I changed the words a little because I’ve never been to Fargo but I spent a lot of time at the Isa and they have a pretty big Rodeo there every year. This song can be applied to anything in life and to me that is what song writing is about. A good story with layers of meaning. 5. Changes Sample – This is a song of mine that got crowded out of the first album so it had to be on this one. A simple little tale with a Buck Owens type feel about how the changes in our lives between meetings can make us realise that maybe things should have stayed the same. 6. There Stands the GlassSample - The classic drinking song from 1953 by one of the original Honky Tonkers: Webb Peirce. I am a big fan of Honky Tonk music because of its directness at sharing emotions that we might feel but rarely openly share. 7. I’ve Got My Baby on My Mind – Written and sung by David Ball from of my favourite albums ‘’Starlight Lounge’’. It’s a happy, dreamy, sort of song that is pure country. 8. We Never Touch at All – I wanted to do a Merle song on the album and also a duet. This is a classic, though not well known Merle Haggard song that lent itself to a duet. Catherine Britt was just starting to make her presence felt in the country scene and was kind enough to share some of her great emerging talent on this track. Merle has been the American artist that has influenced me the most and he in turn was strongly influenced by Lefty. I have never grown tired of singing Merle songs even after 20 or more years. I have always been in awe of the emotion and depth that Merle can wring from 1 or 2 verses and a chorus. 9. Hangin’ In and Hangin’ On – Another David Ball song from “Starlight Lounge’’ that I put on as it is a little different in structure and phrasing and slightly more up tempo. 11. Someone Had to Teach You – George Strait does so much good stuff and he does it so well. I also chose this song because of its swing tempo and Harland Howard was co writer. 12. Piccaninny DawnSample – Terry Martin, a distant relative sent me the words of a poem titled Piccaninny Dawn a couple of years before the album was released. It was a sad tale of a boy called Arthur Cronin who had wondered into the bush and was found dead, two nights and a day later. I was particularly taken by the term Piccaninny Dawn which means the little light before the sun comes up. Piccaninny was also a term used for a small boy that I recall from my childhood around Bushmen and Aborigines. The dual imagery of a small boy in the small light before sun up was very powerful and I am glad I was able to utilise it in this song. I struggled with the lyrics for a number of years. The tendency in some situations like this is to overdo the detail and leave nothing to the imagination. It is a tradition Australian Ballad sung as I have heard so many Slim Dusty songs sung over the years. I couldn’t overlook the huge impact Slim had on my singing, my song writing and my general outlook on life. I didn’t ever meet Slim but like the others I feel he has been a true Country Friend.